Do you cloth diaper? Are you looking for a more gentle, eco-friendly alternative to standard detergents? Are you looking for a detergent that leaves no buildup and works in hard water? Then look no further than Rockin' Green Laundry Detergent!! Rockin' Green was created by a cloth diapering mom whose child had especially sensitive skin and whose skin kept getting irritated by buildup from regular detergents. She worked on creating something that would cleanse the diapers effectively, yet also be gentle on sensitive skin-and Rockin' Green was born. 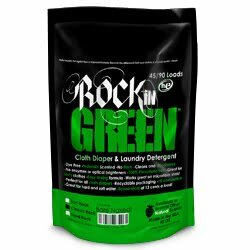 Rockin' Green detergent is dye free, comes in several yummy scents (& an unscented version for sensitive skin), has no fillers, no enzymes and no optical brighteners. Soft Rock: This is the formula designed for the most sensitive of customers! Designed for those with soft water, this formula is just the right mix of gentle cleaners to get the job done with less rinsing.Available in Bare Naked Babies (unscented)only! Classic Rock: This is the sound that started it all. Our original formula is great for diapers and regular clothes. So use it on everything! This formula is designed for those with middle of the road water, not too soft and not too hard. When in doubt start with classic rock! Available in several yummy fragrances and unscented! Hard Rock 2.0: This hard water formula is perfect for those that struggle with diaper laundry! Hard Rock 2.0 will blow you away! So, if you are looking for a better way to launder your diapers check out Rockin' Green today! i love this detergent it really gets it all clean!